Boston: James Munroe and Company, 1836. "THERE WAS A new consciousness." That is how Emerson, writing in 1880, summed up the cultural revolution that defined the most advanced thought and art in the United States in the decades before the Civil War. 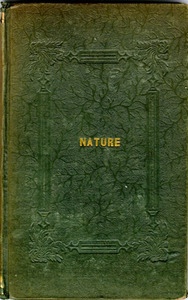 To many at the time, Emerson's first book, Nature, was the bible of the movement. It begins by inviting the new generation to leave the past behind, to "enjoy an original relation to the universe." It ends by exhorting the reader to "build your own world." These "new views"-Emerson's preferred term for what others would soon call Transcendentalism-never became a mass cultural or media phenomenon. Most Americans were more interested in the gold in California than the wealth that Emerson said was to be found within, and more interested in building railroads and factories than in creating the newer world he announced as imminent. But as a prophet or popular philosopher Emerson inspired thousands in his time and helped articulate for all time the idea that America is less a place than a process-a becoming new. Shown is a presentation copy of the first edition, signed "R.W.E." Ralph Waldo Emerson. An Oration Delivered Before The Phi Beta Kappa Society. Boston: James Munroe and Company, 1838. WHEN EMERSON RESIGNED from the ministry to become a prophet of consciousness, he told a friend that his own "particular parish" was "young people inquiring their way in the world." Speaking on behalf of the generation for whom Emerson's was the voice that found them in the wilderness, Theodore Parker wrote about how his words glowed in the American heavens, "drawing the eyes of ingenuous young people to look up to that great new star, a beauty and a mystery, as it led them along new paths and towards new hopes." Emerson's favorite rhetorical occasion was the college oration. In 1837 he gave "The American Scholar" address at Harvard. Telling the students in his audience that colleges exist "to set the hearts of youth on flame," he called for "the helpful giant to destroy the old or build the new." To the "young men crowding to the barriers for the career," he spoke of "the disgust which the principles on which business is managed inspire," and called each one of them instead to "plant himself indomitably on his instincts, and there abide." Oliver Wendell Holmes called this speech "America's declaration of cultural independence." 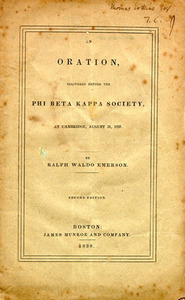 Shown is a second edition of the oration, now known as "The American Scholar." SOON AFTER THOREAU graduated from Harvard in 1837, he tuned in to Emerson's voice-and in the mid-1840s became America's most famous "drop out." When he moved to Walden Pond as a protest against conventional society and as the first citizen of what he calls "the only true America," he disappointed the parents who had scraped and saved to send him to college. When he transformed his two years in the woods into Walden, however, he gave American culture one of its most resonant symbolic gestures. The land he built his cabin on belonged to Emerson, though in his own version of the sixties dictum that you can't trust anyone over thirty Thoreau vehemently denied all debts: "I have lived some thirty years on this planet," he wrote in Walden, "and I have yet to hear the first syllable of valuable or even earnest advice from my seniors. They have told me nothing, and probably cannot tell me anything to the purpose." Shown is a rare "first gathering" of Walden's first signature. WHITMAN ACKNOWLEDGED THE debt this way: "I was simmering, simmering, and Emerson brought me to a boil." Thoreau wrote Walden, he said, to "wake his neighbors up" by "crowing as lustily as chanticleer in the morning." In Leaves of Grass, Whitman "sounds my barbaric yawp over the roofs of the world." An exhilarating combination of mysticism and sexuality, his poetry is a newer testament, a celebration of the kingdom of consciousness that can be found in the soul, in the body, in the "kosmos," and in all the forms of spirit and matter. Whitman urged his listeners to get outside and become "undisguised and naked:" "Unscrew the locks from the doors! Unscrew the doors themselves from their jambs!" Few in his time even recognized his work as poetry, and on several occasions he was prosecuted for obscenity. 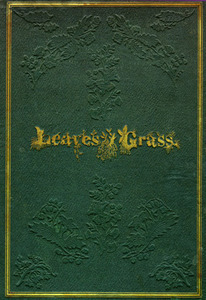 This first edition of Leaves of Grass, which Whitman published himself, had almost no sale at all. Between 1855 and his death in 1892, Whitman kept adding poems to new editions of Leaves of Grass, and by the end of his life had acquired a few disciples. But it wasn't until the twentieth century that the literary critical establishment recognized him as one of the great American poets. To such anti-establishment figures as Allen Ginsberg (who 100 years after Leaves of Grass first appeared used the lines about "unscrewing the locks" as the epigraph to Howl) he was even greater as the prophet of cultural revolution. 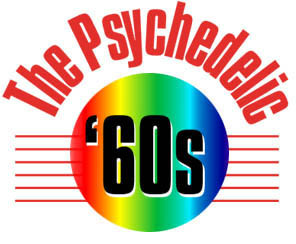 AS IN THE SIXTIES, the "new consciousness" in America in Emerson's time made itself manifest across the whole range of cultural expression, from social life and religion to art and politics. This volume, for example, contains the first publication of Hawthorne's "Main Street," but it is now best-known for an essay called "Resistance to Civil Government, by H.D. Thoreau, Esq." In our time the essay is better-known as "Civil Disobedience." In this work Thoreau describes how he went to jail rather than pay taxes to support the Mexican War and the slave system that he felt was the real reason America was fighting in Mexico. Neither the essay nor Thoreau's act of protest attracted much attention among his contemporaries, but it later inspired Mahatma Gandhi, who read it while in jail in South Africa, and through him Martin Luther King. Thoreau's example was also a major inspiration to the anti-war movement of the sixties. "Break the law," Thoreau writes, "Let your life be a counter friction to stop the machine." Interested in many forms of radical change, from education to utopian communities, Elizabeth Palmer Peabody herself was an important figure in the cultural revolution of the 1840s and 1850s. Henry James caricatures her as Miss Birdseye in The Bostonians. Shown is a signed presentation copy of the first edition. Woman in The Nineteenth Century. New York: Greeley and McElroth 1845. THE WOMAN'S MOVEMENT in America has its origins in this period too. Genealogically its central branch-Elizabeth Cady Stanton, Lucretia Mott, Susan B. Anthony, and so on-grew out of the Abolitionist Movement, and addressed its efforts to specific political reforms like suffrage. Margaret Fuller was never in that camp. 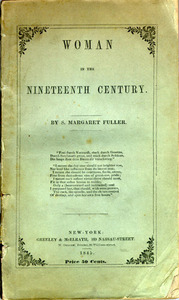 But her Woman in the Nineteenth Century was the first American book devoted to the question of woman's place and rights. It was the final product of Fuller's own participation in the unorganized Transcendentalist movement. Starting from the idea that the divine spirit is in all consciousness, Fuller argues for complete equality between the sexes: "I have believed and intimated that this hope would receive an ampler fruition than ever before in our own land. And it will do so if this land carry out the principles from which sprang our national life. I believe that at present women are the best helpers of one another. Let them think; let them act; till they know what they need."